2018 VENDORS & ARTISTS WILL BE ANNOUNCED SOON! Arnold “Arni” Cohen opened the doors to the flagship restaurant in 1965 at Market Square Shopping Center in Lafayette. Originally seating a little over 100 people, within 10 years Arni’s at Market Square was one of the largest and most successful restaurants in Indiana, with seating for almost 500 patrons. The company is now owned by Arni’s 2 sons, Kurt and Brad Cohen. Arni Cohen was a board member of the Indiana Restaurant Association and was elected to the Indiana Restaurant Association Hall of Fame in 2002. Arni’s operates 18 restaurants throughout Central and Southern Indiana, as well as Linarco Distributing Company, a food production and distribution facility. Andy Korty graduated from Central Catholic in art, moved on to the University of St. Francis graduating in Fine/commercial art focusing in illustration (and was just a few credits short from minoring in philosophy). During that time he worked a comic strip called Fred & Jesse with Aaron Minier and a comic strip with Don Clemmer called For Real. He has done freelance fine art and commercial art. He has also worked in newsprint and signage. He has a beautiful and loving wife, Kristin, an enthusiastic daughter, Anna, and a son,Vincent, who likes to spit up on him. They all live in a big creepy house. B102.9 has All of Today's Hit Music in Lafayette, Indiana. Originally named BlueMoon Comics, the business opened in 1991. After a few changes in ownership, it was renamed BlueMoon Comics Strikes Back. Now at it's current location of 20 1/2 South 16th Street, it is owned by Joe Fickle and Geoff Perry. After being long time customers, Joe and Geoff purchased the store. From the mainstream titles to independent books, they have strived to make it have Lafayette's best selection of comics. The store has strived to offer a selection of everything comic-related, from trade-paperbacks, toys, statues, DVDs, and other assorted merchandise. Blue Moon Comics Strikes Back offers customers a subscription service and are prepared to search for hard-to-find books. Blue Moon Comics Strikes Back desires to offer the best service possible and an atmosphere that is inviting to the casual shopper as well as their dedicated customer. Brandon Michael Barker is an artist and writer living in West Lafayette, Indiana, a fact that he sincerely requests not be counted against his character. He's a really nice guy. Really. He is owner of ManOrMonster? Studios and the creator of WARLORDS OF WOR. He likes odd toys, bad movies, good comics and hair metal. He lives contentedly with his wife and his dogs in a house with a yard that desperately requires some professional help. Brought up in the early 80s on a healthy diet of action cartoons and superhero comics, he developed an early fascination with heroism and myth in the modern age; themes he continues to explore throughout his art, while maintaing in it a fair amount of nostalgic charm and whimsy. Brian K Morris is a freelance writer, novelist, editor, independent publisher, comics scripter, and former mortician's assistant. A recent escapee from Illinois, his work has been seen in BACK ISSUE Magazine, Hogan's Alley, The Jack Kirby Collector, The Krypton Companion, Celebration Comics, and other publications too obscure to mention. He's the editor-in-chief at Silver Phoenix Entertainment and has recently released his fifth novel, THE ORIGINAL SKYMAN BATTLES THE MASTER OF STEAM, based on the comics character. He lives in Lafayette with his wife Cookie, no children, no pets, and too many comic books. Cameron Kotterman currently works as a cover artist and illustrator for InBeon Studios, for comic book the series "Hail Odin." I have had the amazing opportunity to work on various projects with Marvel's own John Tyler Christopher, specifically Hasbro's latest Marvel Legends Action Figure Series. On the side he works as a freelance illustrator and animator. CosAwesome Studios is a Lafayette, Indiana based group of costume builders, models, and cosplayers. Our mission is to spread the awesomeness that is cosplay and costuming. We enjoy having fun in costume, which includes parties, cons, photo shoots, charity events, and holidays. The Doom Room is Lafayette, IN's finest booking for metal, punk, hard rock, and all genres in between. The Doom Room will be hosting the Official LaffyCon After Party Saturday Night (April 1st) at Jerilee's Pub (21 and Up). Con goers receive $2 off the door by showing their LaffyCon Wristband. The Doom Room records high definition footage of every band we book. Are you interested in getting your band recorded with professional grade cameras? We can help! We specialize ONLY in 1966 BATMOBILE ® Replicas, so we are not distracted by other projects. Our dedicated team of ten people work six days a week to complete your car. The replica artisans at Fiberglass Freaks are happy to receive you at our shop at any time, and when you call us, you are talking directly with the builders. We give you regular progress reports, so you know exactly what is happening on your car. THIS YEAR LAFFYCON WILL HAVE AN ACTUAL BAT MOBILE COMPLIMENTS OF FIBERGLASS FREAKS! Grimm Comics will be making their again to LaffyCon! Slinging all of your favorite comics! John Tyler Christopher is a Harvey Award nominated illustrator from Lafayette, In. His work has appeared on the covers of MARVEL’s Avengers Solo: Hawkeye, Star Wars, Figment, New Mutants, Annihilators: Earthfall, Dark Avengers, Spider-man, Venom; and the 50th Anniversary Spider-man Encyclopedia. Other covers appear on Top Cow’s Witchblade and Artifacts as well as DC’s Voodoo. It can also be found in both table-top and video games, as well as film and television. He enjoys spending time with his wife and daughters and waxing intellectually about the shear awesomeness of the Gorn. Journey Into Comics is a podcast dedicated to everything nerd, and has been streaming to the masses since 2014. Hosted by Nate Phillips and Branden Stone, Journey Into Comics has surpassed 100 episodes and is available on podcast services such as iTunes, Podbean, Stitcher, and Google Play Music. Journey Into Comics will be hosting LaffyCon's 2 Day Event this year as our official MCs and hosting all of our panels on stage throughout the event! Located in Market Square, Legendary Games provides a full line of Board Games, Trading Card Games, Role-Playing Games, Miniatures, and Accessories. We offer Magic: The Gathering tournaments 7 days a week with the BEST prize support in the area. Our experienced staff can help you choose the right game for you and your family. Want to demo a board game before you buy, or need some help building or testing your MTG deck? Come on in - we are here to help! Legendary Games pays the most for your MTG cards, and we are always buying! Indiana's largest public pinball arcade with 25+ pinball machines and about a dozen vintage arcade games. Located in Downtown Lafayette (642 Main St, Lafayette, Indiana). Main Street Amusments will be providing SkyCurser (arcade game) at our Con available for play! Skycurser Developers will be on-site talking telling our con goers about the game! WHAT IS SKYCURSER-"SKYCURSER” is a 1 or 2 player co-op horizontal, meat-on-metal, shoot ‘em up (shmup) that is in active development for JAMMA compatible arcade cabinets. Strong influences on the game include Id Software’s Doom, Nazca’s Metal Slug, Namco’s Splatterhouse, James Cameron’s The Terminator and Michael Jackson’s Thriller. In this game, a lone pilot in a one of a kind airplane battles humans, animals, and machines infected by a plague-like disease emitted from a star. The goal of the pilot is to survive waves of enemies by “bursting” them open in spectacularly gory fashion with a brutal yet practical arsenal of weapons – machine gun, shotgun and katana blade. In order to progress the storyline, the pilot must remain untouched by enemy objects. The game ends either by the death of the pilot or destroying the source of the infection. Mark LeMieux is an artist with the innate ability for creative problem solving and the artistic skills of illustration, sculpture and acting. Most recently he was a Casting Technician with Hasbro, Incorporated. Hasbro is the second largest toy company in the world, which is best known for G.I. Joe action figures, and the Star Wars license. Over the four years Mark was employed there, he was an active member in the Research and Development Area. He starting there as a Contractor, and ending there at the position of Assistant Supervisor of the Casting Department. From the earliest days with the company he was considered to be one of the most enthusiastic members of the model shop. With a thirst from learning, and the vast knowledge of the products he quickly became a valued employee. While at Hasbro, Mark also had an opportunity to grow as an artist, learning all he could about sculpture, and design. 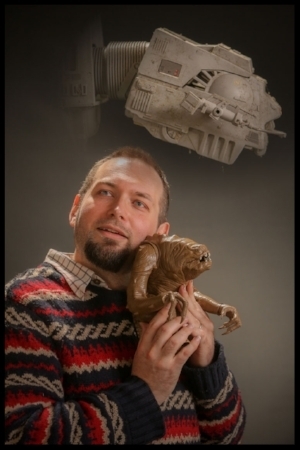 He sculpted over 30 different portraits, several different sets of hands (including articulated hands), and many different accessories for 12” action figures. He also designed several toy lines and board games, some of which are being actively pursued by Hasbro at the present. Mark has an Associate’s Degree in Industrial Design Technology from the Art Institute of Pittsburgh, where he was an Honors Graduate while being employed full time. He is also the owner, director and lead artist of the freelance art company Platypus Productions, that specializes in sculpture, design work, pop culture art, comic illustration, film making, script writing and special effects make-up. He is married and has five children. Purdue Cosplay is a campus group open to any students with an interest in cosplay (costume play), or costume making in general, with the encouragement to join with any skill level or fandom choice. We meet every Tuesday in PRC at 6:30pm, with a meeting/workshop time running until around 10pm. New people always welcome! Our group is committed to the endorsement of the hobby of cosplay, hosting a variety of activities year-round including in-club events, conventions, and community involvement. Show your LaffyCon Wristband on Saturday April 1st and get 20% of your entire order at Richelle's! Richelle In A Handbasket can help you give the perfect gift to that special person in your life. Our gift shop is located in Lafayette, Indiana bringing joy to the Lafayette, Indiana community. We create homemade treats, gift baskets & custom gifts that allow you to show how much you care. Some of our sweets include truffles, chocolate bark, s’mores, buckeyes, pretzel squares, caramel pecan patties, scone mix, shortbread mix, biscuit mix and amazing caramel corn. We also have our own coffee blend that the Lafayette, IN community enjoys. We proudly work with local craftsmen and small business owners to bring items that are handcrafted into our gift baskets. We create themed gift baskets and boxes, as well as one-of-a-kind gifts that are custom to your needs. Show someone you truly care with some sweet chocolate treats or a custom gift basket. Visit Richelle In A Handbasket today! Robert DeJesus makes his first appearance at Laffycon this year! He has worked for Antarctic Press, Radio Comix, Wayforward, Marvel, Dark Horse, Hasbro, HarperCollins, and PlayStation Magazine. Be sure to stop by his booth! Wabash Paranormal Research Society (WPRS) consists of a team of dedicated investigators who bring professionalism, personality, and confidentiality to each case we investigate. We understand that it is tough to call someone like us, and we respect your right to privacy. Some of our investigators have lived with paranormal activity and can identify with others who may be dealing with the same situation. Our goal is to document, and hopefully someday scientifically prove the existence of the paranormal. We take what we do seriously, and are here to assist people who are experiencing unusual, frightening, or seemingly unexplainable events. When we are invited into your home or business, you can expect to meet a professional team who will respect both your property and your privacy, as well as understand the fact that you may be frightened and confused. We will listen to your experiences and concerns. Then we will set up equipment and begin trying to recreate and debunk personal experiences in an attempt to find good evidence either for or against paranormal activity. We will document and analyze all of our findings during your investigation and attempt to determine the true nature of the activity. We will then share our findings with you and come to a conclusion. We will then help you to understand some of the nature of the problem supplying you with the information to understand why this is happening and how little danger is actually involved. WPRS hopes that through scientific research and a common sense approach, we can achieve a better understanding of this phenomena. All findings presented to our clients and shown on our website have been analyzed by WPRS members. We make every attempt to identify and explain everything we find that is questionable. We only present to our clients what can not be explained by natural or man-made occurrences. WPRS feels that skepticism, common sense and an open mind is essential when researching and investigating the paranormal and that all reasonable explanations should be ruled out prior to declaring an experience to be paranormal in nature. We do this free of charge. Wulfgar Weapons is a Professional Prop - Design and Fabrication shop where customer satisfaction and commitment comes first. We work in the realms of film, theater, cosplay, and music videos.Located in Lafayette, Indiana we are willing to travel and ship world wide. Wulfgar Weapons is made of a team of like-minded professional artists, dedicated to producing top of the line prop weapons. Our team consists of Costumers, Gamers, Illustrators, Sculptors, Set- Builders, Actors, Models, and Photographers.